The market for strong chess computers is tough, because the PC software have a CPU power and a storage capability infinitely greater for a cheap price. 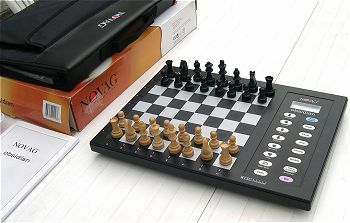 As the price is a major decision factor, the chess boards are not very beautiful and the comfort of use is average even if it remains greater as a PC without a chess board attached. On the market today, there are still 2 auto-response boards left: The Mephisto Exclusive Senator and the Novag Citrine, two beautiful objects with an incomparable comfort of use. In 1998 Saitek integrated the GK-2100 program as 4 variants: the MM VI module on a sensor chess board Mephisto exclusive, the President module on the sensor chess board Kasparov, the travel game Kasparov Cosmos and the Kasparov Centurion. The Saitek President is a beautifull game but it's unusual to see the module outside and not hidden. Here is a test game. This Mephisto MM-VI is a variant of the Saitek President. In the user manual, it's indicated a clock frequency of 20MHz but this is a 10MHz processor. The MM VI chessboard is a bit bigger than the Président' one. This program was written by Frans Morsch and is rated around 2000 Swedish ELO. It is an enhancement of the GK 2000 (published in 1992, rated around 1900 Elo). It's a lower variant of the high level program Mephisto Atlanta / Milano Pro / Senator / Magellan / Mephisto Master (around 2200 Elo). This 32 Kb program is strong. It has an opening library of 35000 half moves, a 10 MHz processor H8000. 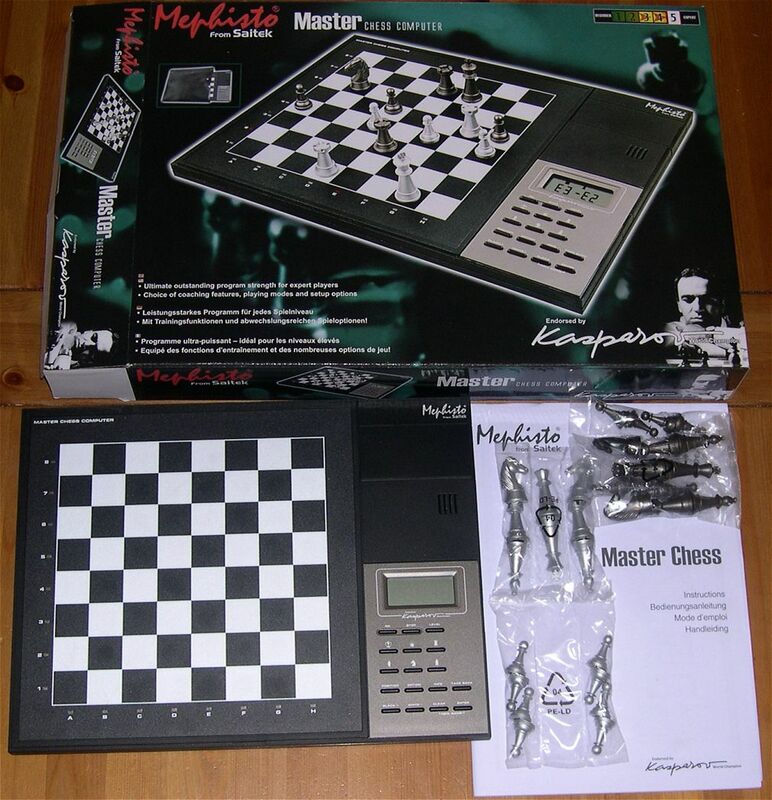 It also has unusual functionalities: display of the move currently analyzed, 20 famous games used to evaluate your Elo level, Self adaptive levels to maintain the motivation of young players, different kind of teaching functions. Here is a test game with the MM VI. The Centurion contains the same programme as the President with a reduced opening library of 6000 half moves. 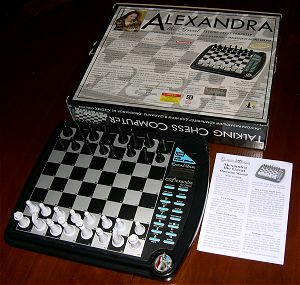 It is sold in an optimized price packaging, with plastic pieces. In this test game, I won but after at least 10 "take back" suring the 20 first moves, then I began to master the game. It put me in some opening options I did not master, with the center occupied late in the game. It was really good in the deployment phase of the game. 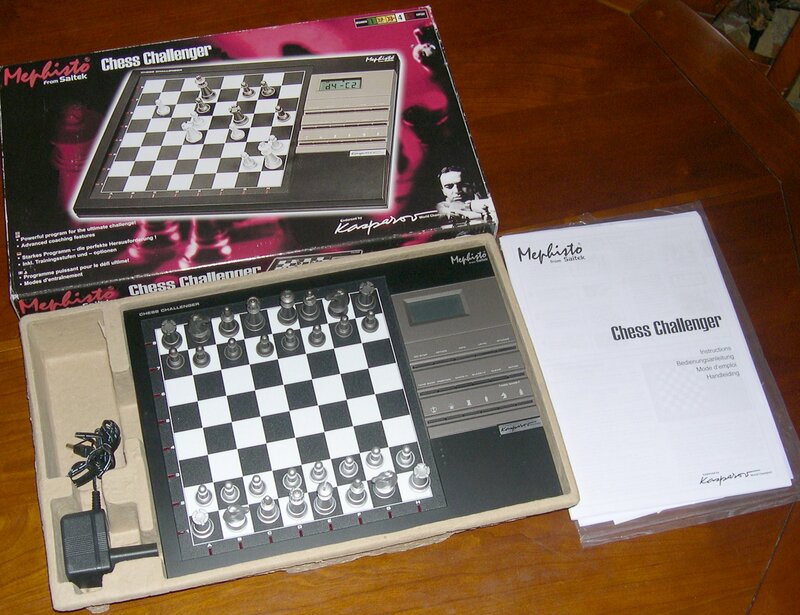 The Champion 2250xl is probably the strongest chess computer ever published by RadioShack. It costed $ 170 in 1996. It's a variant of the Saitek Centurion. Its design is very different: not so nice but with a LCD chessboard. There are also minor functional differences (for instance 20000 moves in the opening library). 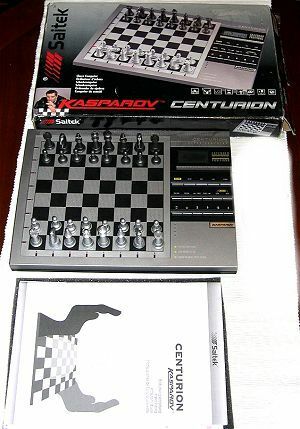 In 2004, the Centurion was repackaged and distributed under the name Saitek Mephisto Admiral first and then Saitek Mephisto Chess Challenger. The hardware and software is the same as the Centurion. 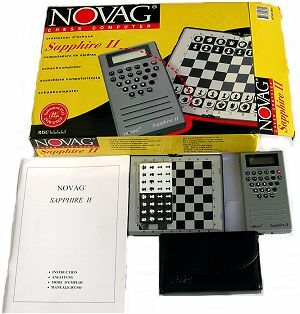 Novag distributed in this calculator package the best programs from David Kittinger: the VIP (8 bits processor, 8MHz, 16K, 1600 Elo), the super VIP (8 bit processor, 9,8 MHz, 48K, 1700 Elo), the Ruby (Risc processor, 20MHz, 32K, 1900 ELO), the Sapphire (Risc processor, 26,6 MHz, 64K ROM, 2090 ELO) and the Sapphire II (Risc processor, 32MHz, 160K ROM, 118K hashtables, 2100 ELO). The Ruby is clearly a good program. 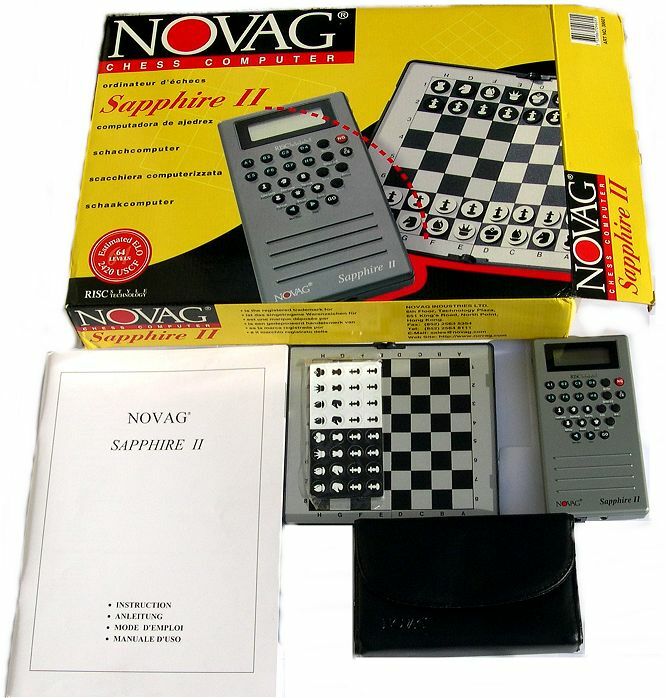 I tested it on complex problems and compared it with the Sapphire II. These programs are very different. Overall, the Ruby was 3 time slower on mid game combinations. In finales, the hashtables of the Sapphire 2 made sometime the difference but not always. The finale program of the Ruby is good and optimised. At each move, it displays the score and the 2 next best half moves. This is very good to learn. The Ruby has a quite heavy random factor: it plays several variants on the same position, so it's a very interesting programme: See for instance this test game. 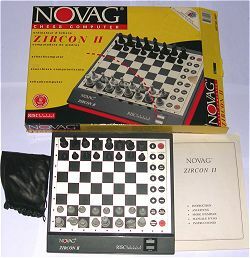 The Zircon contains the same hardware and software that the Novag Ruby (Risc processor, 20MHz, 32K, 1900 ELO). The 1900 ELO from 1995 is devaluated today (see for instance the ELO list of www.schachcomputer.at). In reality, Alexis made some test games between the Novag Zircon and the Saitek Chess Explorer (here under). During 10 test games played at different levels (between 30 s and 2 mn per move) the Méphisto won 7 time and made one draw, and lost only 2 time. Here is a victory from the Explorer on the Zircon. 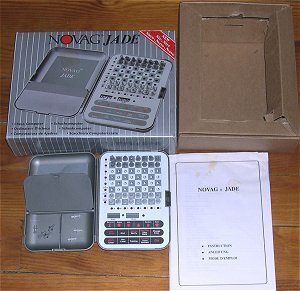 The Jade (1995) includes the same hardware and software as the Novag Zircon and the Novag Ruby (processeur Risc, 20MHz, 32K, 1900 ELO). It is a high end travel game. The Zircon II is identical to the Zircon (software of 32Kb written by Dave Kittinger) except some colour differences and a processor a bit faster: 26,6 MHz against 20 MHz. It is rated around 1950 ELO. Just for fun, the Zircon II, the Amethyst and the Amber are three Novag games but also three textile printers. This chess computer is for club chess players with a good level. Here is a test game. 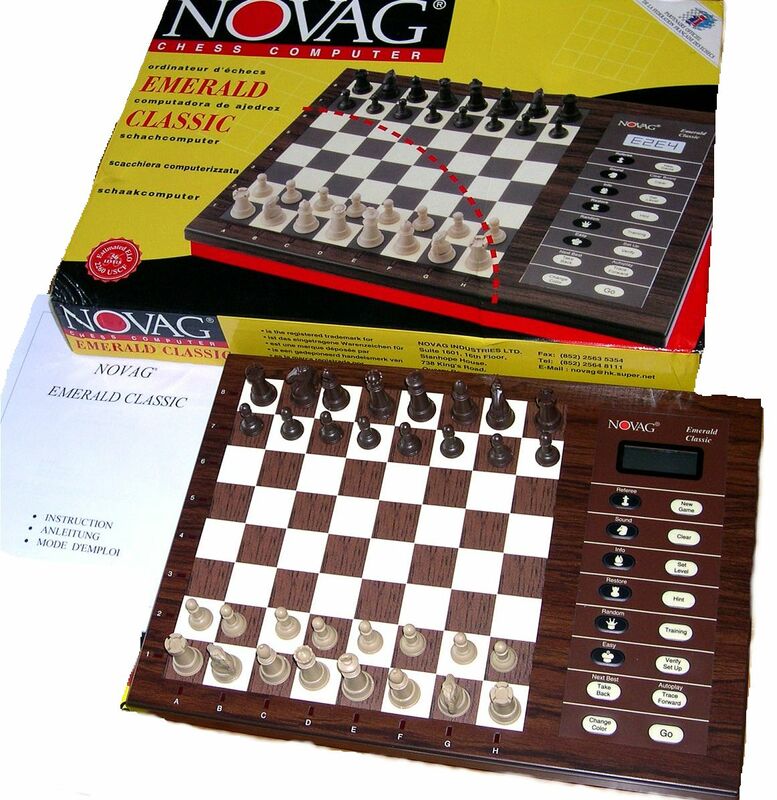 The Novag Emerald Classic is from 1996 and is a Zircon II variant in a nice wood coloured design. The Zircon II software was probably a bit debugged because Novag claimed 2260 Elo against 2240 for the Zircon II. 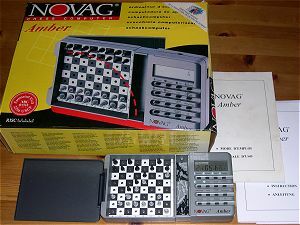 This machine was later replaced by the Novag Emerald Classic plus with a modified software: a smaller opening library and redesigned playing levels. It's a very good player, see this test game. The Novag Turquoise succeeded to the Zircon II. It includes the same processor but with an opening library of 8900 half moves and 128 game levels against 13000 half moves and 48 levels for the Zircon II. The design is nice even if only one display remains. 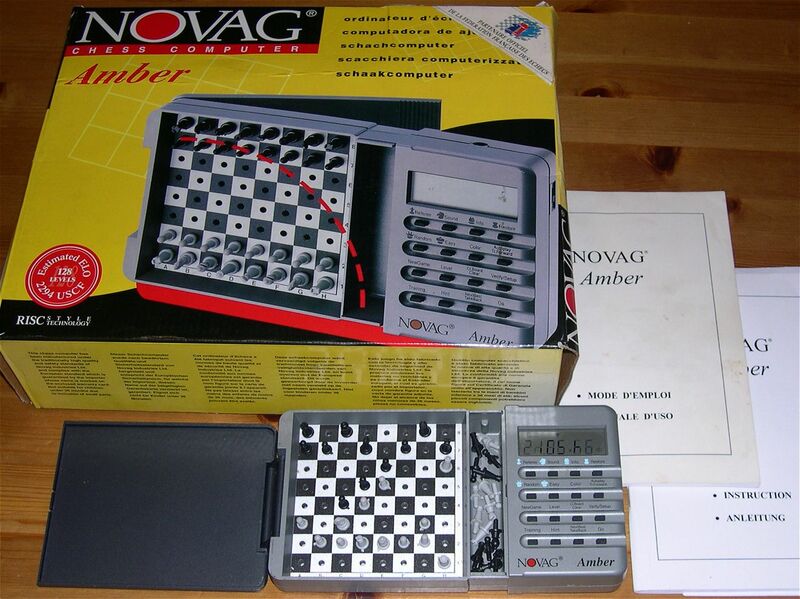 This software was also distributed in a wood coloured design under the name Novag Emerald Classic plus. 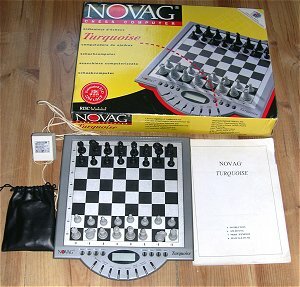 The Novag Amber is a travel game release of the Novag Turquoise. It is very small but has a high level - around 1940 ELO. The design is a bit unusual, With 2 big box on the sides to store the pieces. The screen is green backlighted and is well readable. It's still possible to buy this game for 70 euros in germany and 110 euros (!) in France. The Saitek Explorer Pro is an improved release of the Chess Explorer. The software is coming from the Saitek Cougar, with a very strong game level (around 2050 ELO). I had great diffuclties to beat it and and this test game was a victory only after many "trials and take back". I found it very strong in defense. To my mind, it's a very good value for the money. 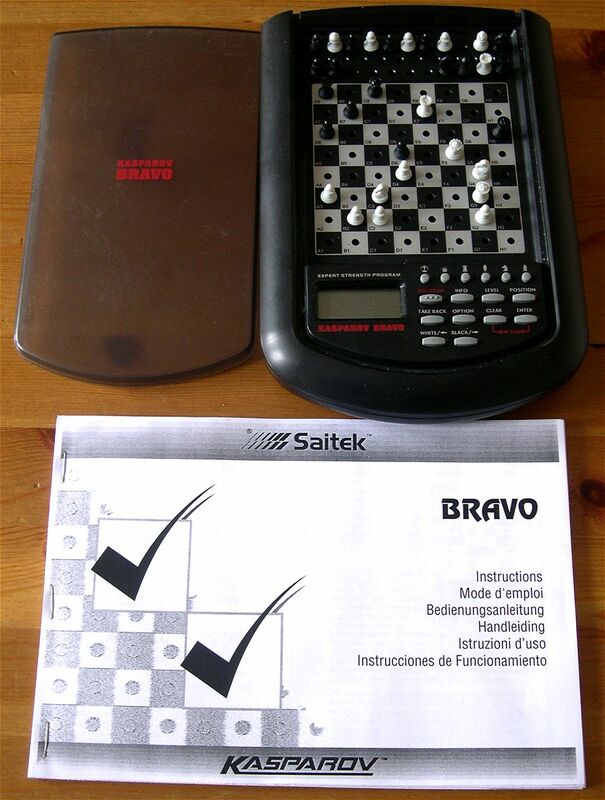 The Saitek Bravo is a travel chess game with a good level. It includes the same software as the Saitek Explorer. Both user manuals are almost identical. It was later replaced by the Mephisto Miami then by the Mephisto Advanced Travel Chess Computer also called Mephisto Diplomat. All these games are strictly the same. 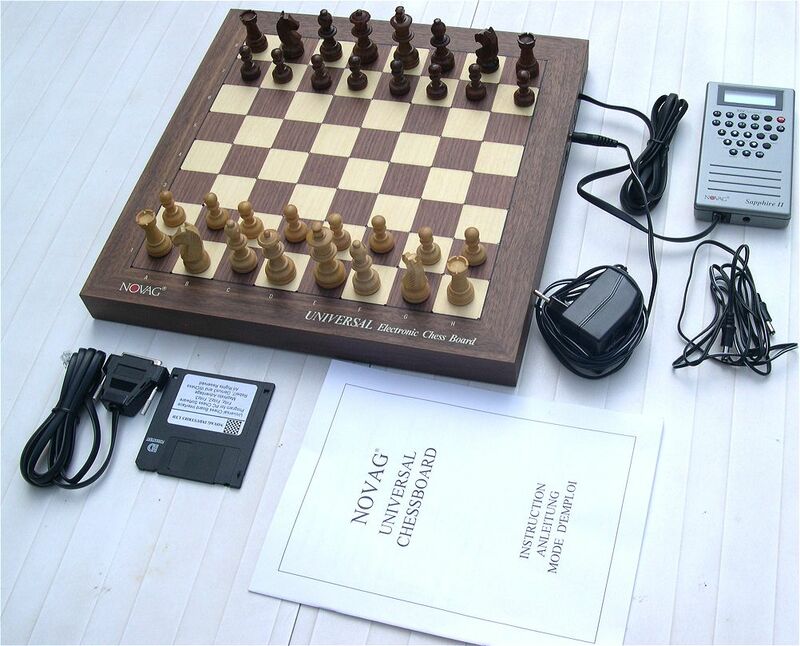 It's an high level chess computer, with wooden pieces and a transportation bag. But it has some little defaults around the keyboard: "bubbles under the plastic film". To my mind, I do not like black pieces on black background. It's a very nice player and It's good to test different game levels. Here is a test game at 1mn per move and two variants at 2mn per move. The Sapphire (Risc processor, 26,6 MHz, 64K ROM, 2090 ELO) contains one of the best program available on the market, published in 1994. More than 2000 ELO, a processor RISC with 26,6 MHz, 64 K Rom, 129 K Ram and 118K of Hashtables, 36000 positions in the opening library. This chef d'oeuvre by David Kittinger is a real program for pros. This program is available in a box with a travel game. 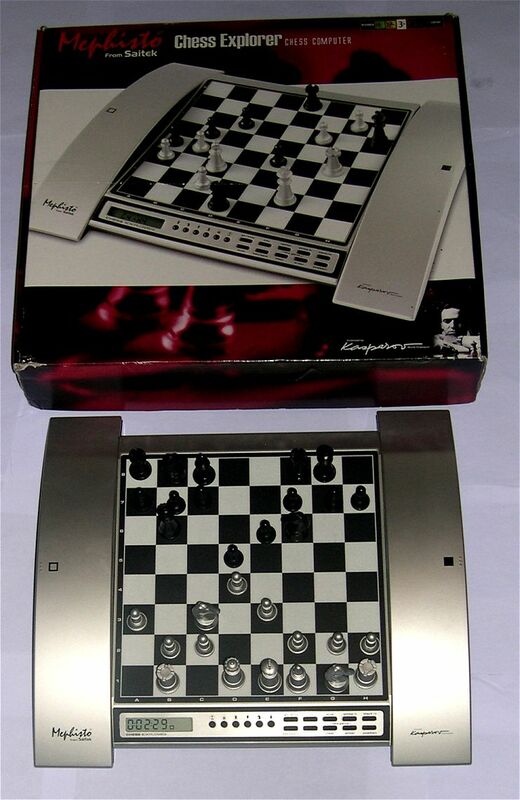 It can also be connected to the Universal Chess Board. But the whole set looks not very nice because there are 3 long cables to connect the games and power supply. It tooks me several weeks to find some weakpoints and beat him in this test game. 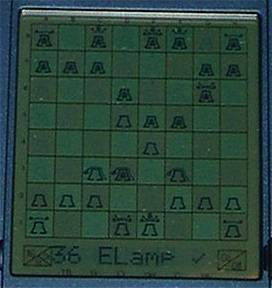 It was the most difficult opponent I ever played in all my tests. 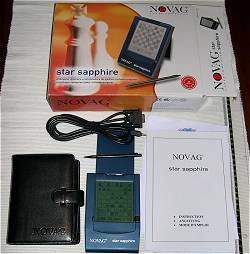 This device is a small improvement of the Sapphire. It does not have a very nice look but it contains one of the best program available on the market, published in 1997. 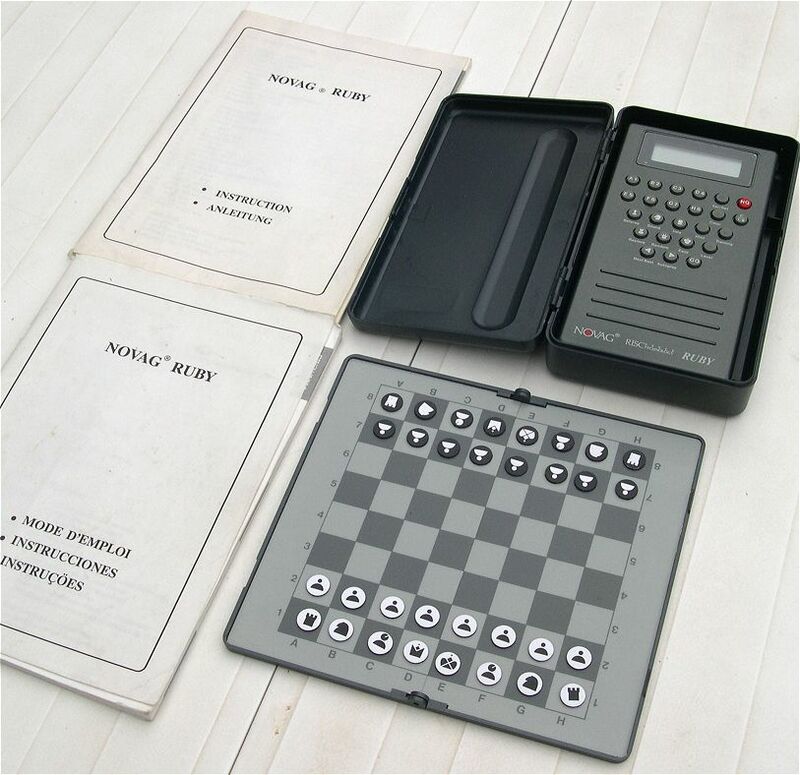 More than 2000 ELO, a processor RISC with 32 MHz, 160 Kb Rom, 129 Kb Ram and 118Kb for Hashtables, 123000 positions in the opening library. It's a small travel game but it was sold in a big box. 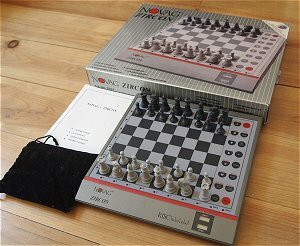 I tested it on positions hard to solve by chess computers: it solves everything with its level 3 mn per move (except one mate in 5 where he needed 5 minutes). 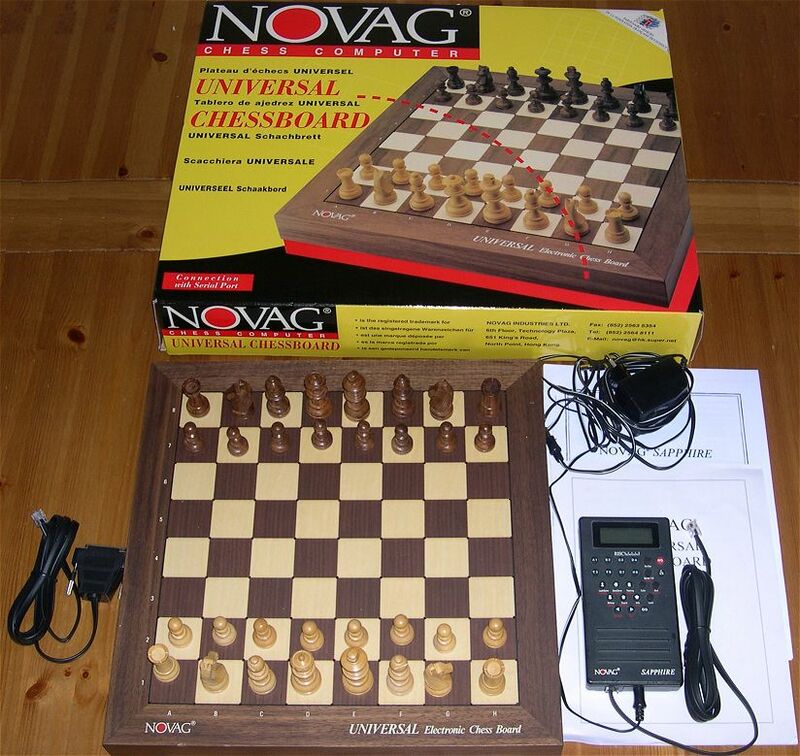 When connected to the Universal Electronic Chess Board, it's the most powerfull Novag software on a wooden auto sensory chess board. The chessboard and the pieces are a bit smaller than those of the Mephisto Exclusive and there is again to many connection cables. A link: Inside the Sapphire II. 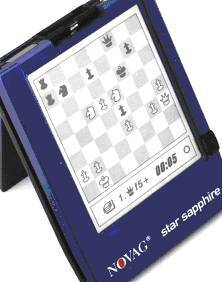 This was the last device from the sapphire serie. It contains the best programm ever published by Novag: 2200 ELO, a processor RISC with 25 MHz, 572 Kb Rom, 256 Kb Ram, 123000 positions in the opening library. It has a lot of functionalities including saving of 64 games. Unfortunately, the usability of the screen is poor: there is only few graphic differences between the king, the queen, the rook and the bishop so I allways used this game with a small magnetic chess game (my good old novag solo). You can compare the preliminary design (to the left) to the poor reality. After some experience, the usability of the different menus is good. It used a lot of battery and when the battery are changed, all the game stored in the memory are lost. So I also had to capture my games on paper. Outside these small problems, it's a really interesting device and I had a lot of fun trying again and again variants on the same game until I won. Here are my first victory and a faster variant. The Senator module is a faster MM VI (x2) with some minor improvements, so it is rated 100 ELO more. 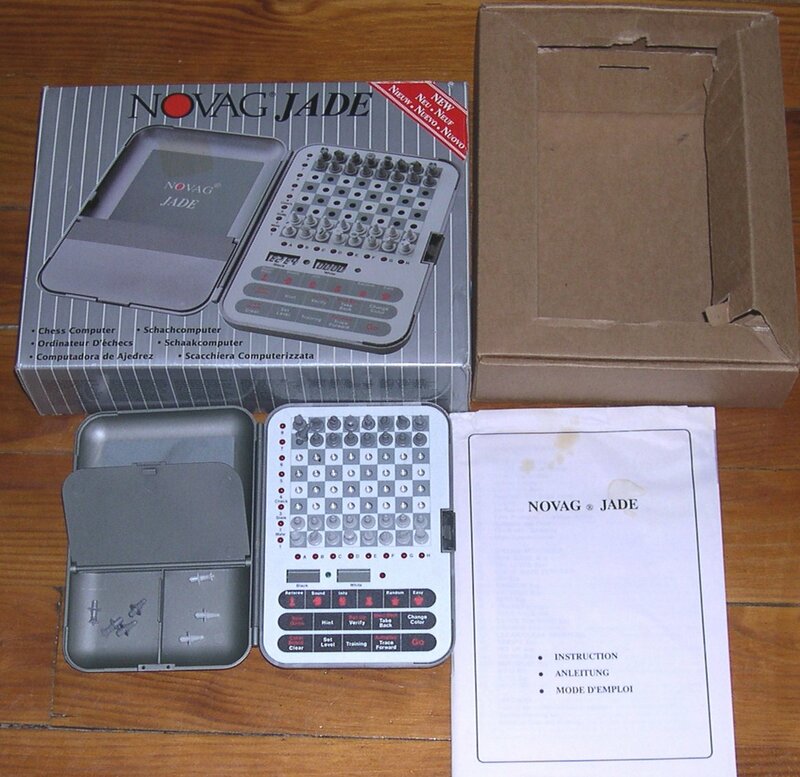 It came to the market in 1998 and was widely distributed after the year 2000 at the price of 600 euros. But Saitek stopped the production and it's now very hard to find one in stores. It's a very strong software but here is a nice victory at	1 mn per move. 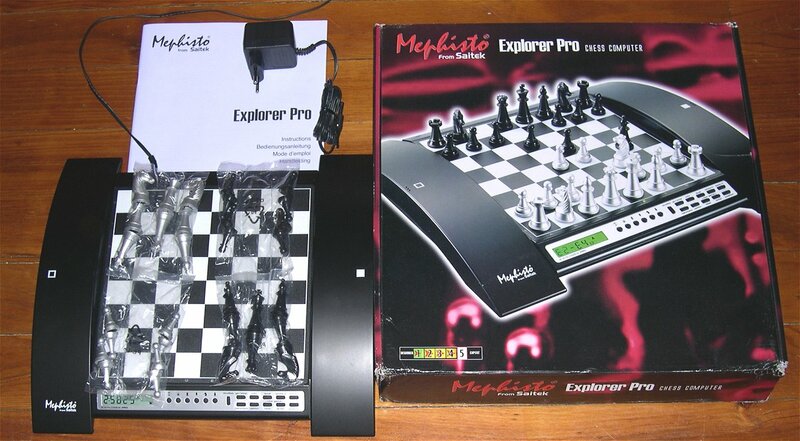 With a rating of 2100 ELO and an opening library of 5000 half moves, the Mephisto Master Chess is the strongest chess computer still available in stores today. It's the same software as the Mephisto Milano Pro. 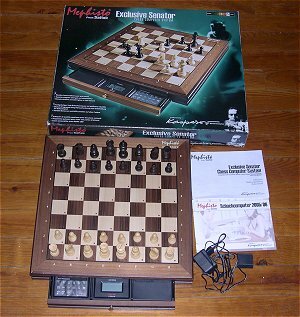 It's a variant of the Mephisto Senator but with many small differences in the moves it plays. I found a bug in the software: it stupidely lost a bishop in this test game at 2mn per move. This kind of bug is very very rare, and it's a very strong software. Like the Magellan or the Senator, it will often block the game and to beat it, the player often has to exchange with a minor material disavantage, see this test game at 3 mn per move and at 1 mn per move. 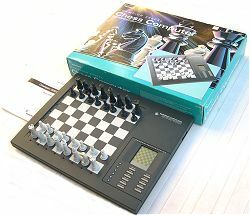 - UK: www.elhchess.demon.co.uk or www.chessbaron.co.uk. 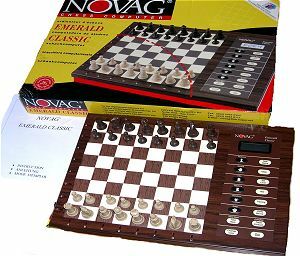 The Novag Citrine is the last auto sensory wooden chess board available in stores. It is also the cheapest one ever published and it really looks nice. However, the usability is not perfect. For instance, to take a pawn with a rook, you have to take the rook first. You can not remove the pawn before taking the rook. There are also missing informations on the screen: if you play a sudden death game, you can see your time decreasing but not the time of the Citrine. 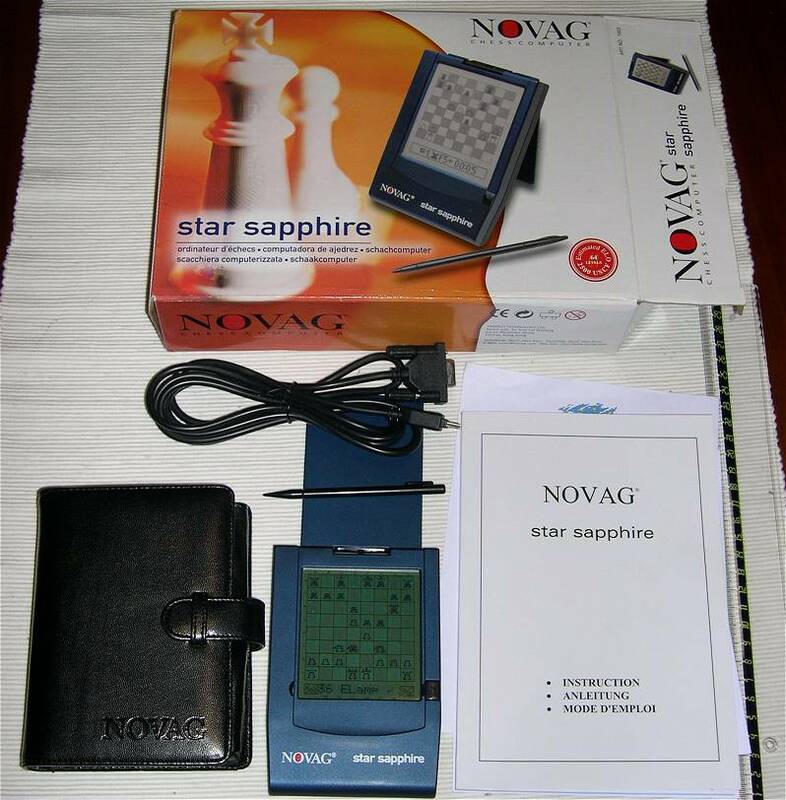 The game level is quite good (2000 ELO) but it is below the Novag Sapphire or Sapphire II. Here is a test game. 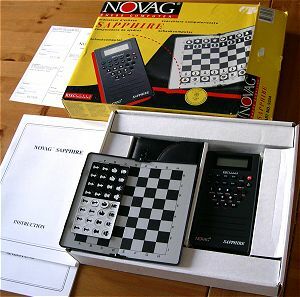 It's a nice software, able to solve many chess problems - very similar to the Novag Obsidian. The Excalibur Phantom Force is a chess robot from 2007. It succeeded to the Excalibur Mirage. 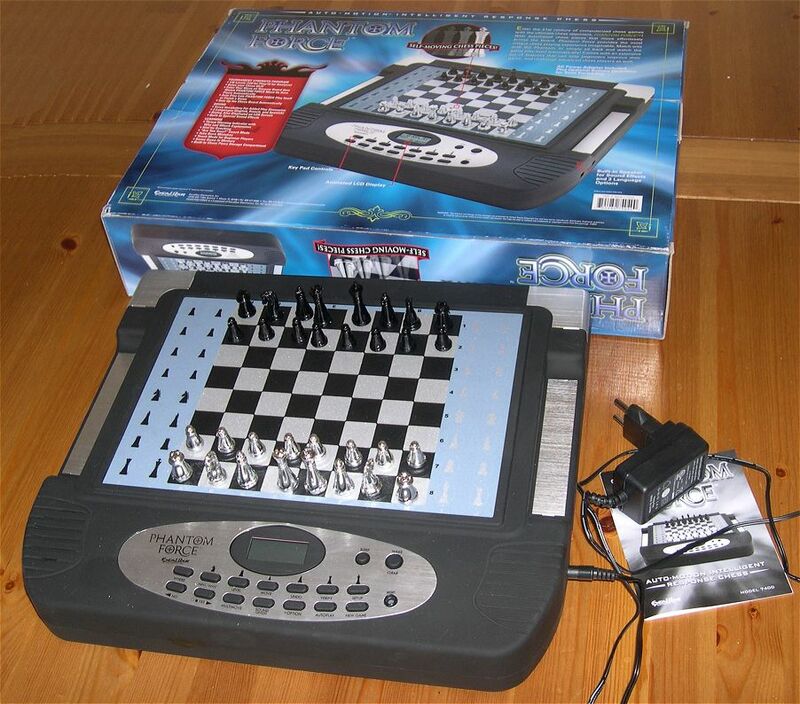 It moves alone its pieces using a robotic arm under the chessboard. The pieces are light and a bit small. they used to sweep to facilitate the robotic movements. So it's uneasy to be manipulated by big fingers. But this game is fascinating. It's not a champion but the game level is quite good at 3mn per move. However, there is a big weakness in the algorithm: the game do not react properly to a pawn attack. A test game at 2mn per move and a test game at 3mn per move. Alexandra the Great is a game sponsored by Alexandra Kosteniuk. There are 2 different variants: the 908 that speaks English, French and German and this 908-R that speaks English, Spanish and Russian. 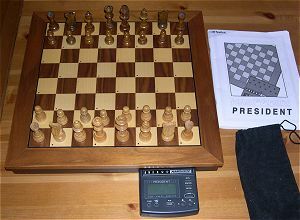 It's a software very similar to the Phantom, with the same weakness in the algorithm: the game do not react properly to a pawn attack, see this test game. Two very interesting links: the podcat "chess is cool" by Alexandra Kosteniuk and Chessmovies.com with several videos of Alexandra. 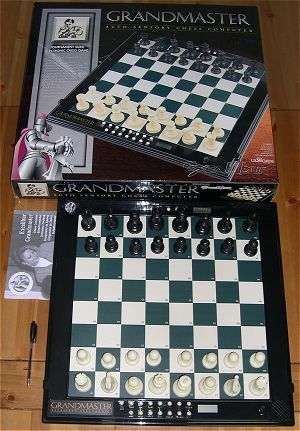 The Excalibur Grandmaster is an uncommon game marketted for club players. It's a great size game, with a vinyl chessboard (US coloured green/cream) and big turnament size pieces. It's an auto-sensory board: the movements are detected with magnetic sensors. 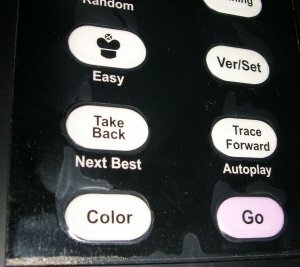 But there are no leds: the computer movements are indicated on a small screen. In any case, the player has to take the starting piece first. But globally, its big size make it very confortable to use. The software, very similar to the Phantoms one, is rated around 1850 ELO. It is weaker than a Novag Sapphire or a Mephisto Senator. But against a human player, it has a nice game style as you can see on the two following test games: at 2mn per move and at 3mn per move (clearly better). It's a game designed for clubs. 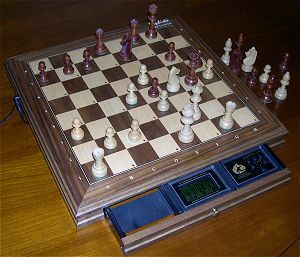 It includes functions made to assist 2 players, with 2 displays that may indicate the position evaluation and give hints. But there is one missing function: there is no info mode, that displays the following moves prefered by the software during its calculation time. To conclude, I am a fan. 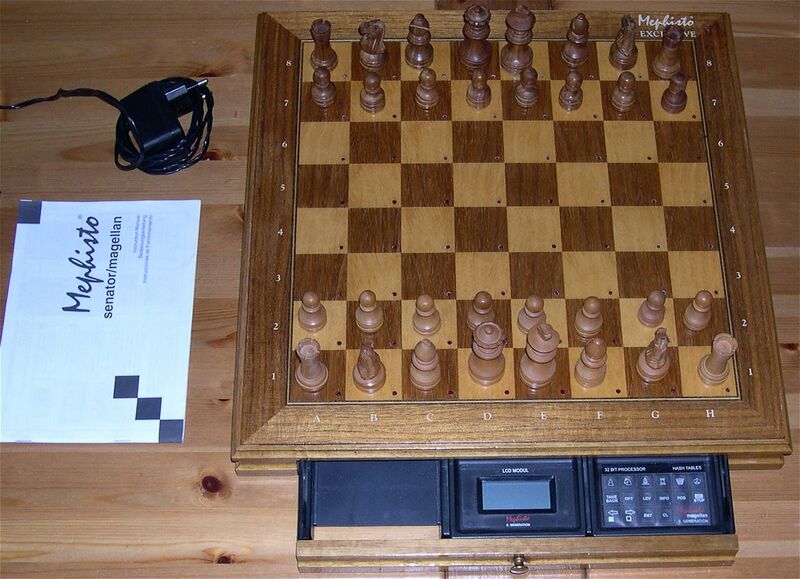 Here you have the strongest chess computer in the world - 2650 ELO - an xscale 500MHz processor. 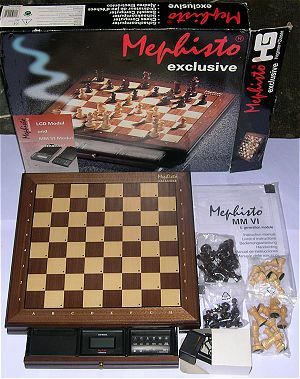 Here is the "Mephisto module" set but there is also a complete game named "Revelation". This game is a small scale production by Ruud Martin. It's a luxury product for passionate players. Such purchase can not be made using an economic logic. 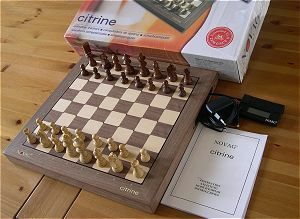 The game and the board costed me around 1750 euros. It includes 6 chess engines: Ruffian 2.1, Deep Sjeng 1.8, Fruit 2.1, Toga 1.2, Deep Sjeng 3.0 and Rybka 2.2n2 - the strongest one. Rybka 2.2n2 is also available as freeware on PC under Arena. On your PC, Rybka will be more powerfull. And it is also possible to connect the Novag Citrine chessboard (300 euros) on the PC. The resurrection II is a high quality product. Rybka 2.2n2 is a powerfull software with a very interesting game style. But it is far to be invincible because it has some weaknesses around the knowledge of good positions. Its very strong CPU power is not enough to compensate. I started to test a lot the game at 15s per move then I played at 1 mn per move. Here you first have a game I lost that shows well its game style, with some forces and some possible weaknesses. Then you have a test game I won at 1 mn per move. Here you can see its weaknesses.